Bowser's Gnarly Party is a board located above a sea of lava in Mario Party 4. It is hosted by Koopa Kid. He built it in honor of Bowser's greatness and wanted the players to have fun on it – whether they wanted to or not. Here, Koopa Kids were everywhere, and were put in charge of the games and shops. 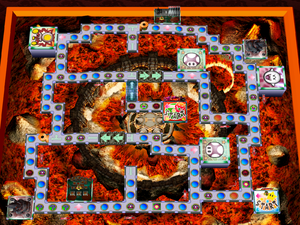 In the very center of the board, a giant scorched Bowser Shell can be seen, surrounded by a building that resembles the Colosseum. The main attractions of this board are the two stone bridges and Bowser. Every time a stone bridge is crossed, pieces of it will crumble off. When it is crossed three times, it collapses and a new one appears leading in the other direction. Bowser is always on his platform somewhere on the board, waiting for a character to pass him (and changes his position every time a player trades 20 coins for a Star from Koopa Kid). He does different things to players depending on what size they are. When a player reaches him at normal size, he will take away half of their coins (but gives fifty coins to players that have none). If a player reaches him while miniaturized, he will use his fire breath to send them to a different starting point in the middle of the board. If a player gets to him in their mega form, he will challenge them to either Bowser Wrestling or Panels of Doom (though the Bowser mega minigame is not the final battle minigame The Final Battle! if this is done on Story Mode). If the player loses, half of their coins are taken away and he still remains on the board. Victory results in Bowser leaving the board until the player or any other player trades 20 coins for the next star from Koopa Kid; where he will reappear and change his position. If a player reaches him while wearing the Bowser Suit, he will give the player 50 coins. Every few turns, Bowser uses his magic to make everyone miniaturized for that turn. This also disables the players' ability to use items, similarly to a MiniMega Hammer. Landing on an Happening Space, all of which are located behind the Gates, will cause the Bowser head statue in front of the spaces to breathe fire, destroying one of the player's items. The Item Minigame of the board, Koopa Kid Shuffle (called Mini-Bowser Shuffle in PAL regions), involves a Koopa Kid with three boxes. He puts an item in each of them then shuffles them around. After that, the player chooses one of them. However, the player doesn't get the item in the one he or she chooses, instead, that box instead becomes locked. After eliminating 2 boxes, Koopa Kid gives the item in the remaining box to the player. The Coin Minigame, Brake Bullet Bill, involves a Bullet Bill. In it, a Koopa Kid shoots the Bullet Bill at the player, and the player must mash to slow it down with his or her hands. The faster the player mashes , the shorter the speeding bullet will fly, and the player will be awarded more coins as well. In Story Mode, if the player beats their opponents on this board, it will be unlocked to play in Party Mode. It is not necessary to defeat Bowser in his mini-game, The Final Battle!, and complete Story Mode for this unlockable.